Home BUSINESS Are you being ripped off by the gig economy? Almost three million people have worked in the gig economy in the last 12 months, according to official figures, where, traditionally, there has been a trade off. Self-employed workers earned a higher hourly or day rate than staff, to offset the lack of employee benefits such as pension contributions, paid leave and time off sick, as they would need to fund such downtime and extras themselves. Freelance workers took extra risk and, for many, their pay reflected that. Fast forward to 2018 when the gig economy is rocketing in size and scope, and there appears to be no such relationship between risk and reward. 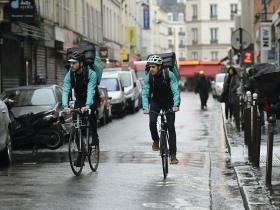 A government report into the gig economy has revealed that one in four of the workers it surveyed were earning less than £7.50 an hour. The national living wage – the minimum an employee aged over 25 can earn – is £7.83 an hour. So how much should independent workers be charging? The website WhatIsMyDayRate.com tries to make this simple for freelancers by highlighting what their day rate needs to be to achieve their desired annual salary. For people moving from salaried work to freelance work, setting a day rate can be a real challenge. For example, if you have a target annual income of £30,000 then it might be tempting to set your day rate at £30,000/365 – or perhaps you might work out a more complicated sum factoring in weekends and how much holiday you plan to take. Yet the website reveals that freelance workers would need to earn £39,000 a year in order to make up for the benefits an employee earning £30,000 would make – including 20 per cent of that salary in healthcare, pension contributions and more. What’s more, you need to factor in unpaid sick days, unpaid public holidays and the 20 per cent of time that a typical freelancer spends on non-billable work. You end up needing to earn £39,000 over 181 days, meaning a day rate of £215.71. If you had simply said you intend to work 5 days a week for 48 weeks a year then you would probably have set your day rate at £125 in an attempt to earn £30,000. It would have fallen short. Workers in the gig economy need to protect themselves by charging a fair fee for their work, but with more people than ever searching for flexible hours and the opportunity to manage their own work, it can be hard not to end up in a race to the bottom in terms of pay and conditions. Millennials and anyone working in the gig economy need to have a clearer idea of their rights and value. So what rights do they have? For employers, this growing army of skilled, flexible workers makes it easy to get work done without the responsibility of taking on employees. Research from Deloitte shows that 75 per cent of UK business leaders say there is a significant number of contractors in their workforces; 46 per cent say they have a significant number of freelancers and 12 per cent report a significant number of gig workers. Yet if gig economy workers were given more rights and better working conditions, their work status could be affected, causing both them and their clients difficulties. Julia Kermode is chief executive of The Freelancer & Contractor Services Association (FCSA). She explains: “For the majority of independent workers it is an informed choice and they value the flexibility that being self-employed offers. Of course, that lack of protection is only acceptable if workers have a real choice about whether to apply for roles as employees or go it alone as contract, freelance and gig workers. Helen Hughes, employment law specialist at the law firm Shakespeare Martineau, says: “There is an astonishing lack of clarity in the employment laws intended to protect workers. Many employers rely on flexible workers to cover for sickness or seasonal peaks in demand. Of course, when it comes to employment rights, what matters is not whether the worker is labelled as freelance but rather the nature of their work and conditions. Peninsula’s Price adds: “Whilst many gig employers will label their workforce as a particular status, eg self-employed independent contractors, what matters is how the relationship works in reality, not what label is placed on the individual. “In most gig companies as there is control over the individual and they are required to carry out the ‘gig’ themselves, the individual will usually fall within the category of ‘worker’. Independent workers can also find themselves at a significant disadvantage when it comes to accessing financial products as well. Michelle Wright, founder of social enterprise champion Cause4, says that the working world has changed but the country is still playing catch-up. “We need to put our insurers, banks and pension providers under pressure to provide products that can service this new community of flexible workers, and also give employers wanting to embrace this new culture a range of services to support their temporary employees. As well as often finding themselves disqualified from common financial products, research from LV= shows that around two million self-employed workers can’t afford to save anything each month, while a further one in 10 save less than £50 each month. The government is aware of the challenges facing the independent workforce in this country. It responded to last year’s independent Taylor Review into modern working practices by promising to strengthen the rights of flexible workers, including those on zero-hour contracts and working within the gig economy. Improving rights would be welcome, but some commentators have expressed fears that to do so might damage the flexibility that so many workers value. Natanje Holt, retirement specialist at the technology provider Bravura Solutions, says the answer might lie in defining a new type of worker: “It’s also important that as we seek to protect gig and self-employed workers, this does not come at the expense of their freedom and flexibility. Paul Ryman, senior associate in the employment team at commercial law firm Brabners, warns that any work the government does undertake must be future-proofed to protect workers in a rapidly changing working world. He says: “The challenge we face now is that technology is outpacing legislation. The types of businesses that are currently at the forefront of the gig economy debate did not exist five to 10 years ago and, to some extent, the law is still playing catch up. What’s needed is a more solid clarification of what ‘worker status’ means in practice. “Yes, it’s positive to see that the government is taking action to address the concerns raised by the Taylor Review. The new draft Employment Bill that is currently before Parliament takes on most of its recommendations. In sectors like technology and e-commerce that move so quickly, it’s a challenge to ensure that any new laws aren’t already out of date by the time they are passed.